MARS School attendance program is designed to address the core issues of students who are having truancy issues. We do this through a school attendance conference. The meeting typically involves: school staff, students, family members, involved parties and guardians. Participants take responsibility for the issues involved, and write a clear plan that all participants agree on. 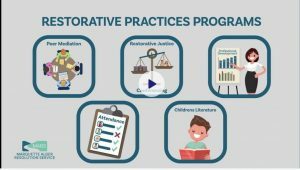 Restorative Justice Mediation is a pro-active process designed to help schools address students who break the school code of conduct or are in conflict with another student or adult. In 2016, The Michigan Rethink Discipline bills were passed (Public Acts 360-366). The new laws end state-mandated expulsions for everything except firearms. School districts must consider using restorative practices as an alternative or in addition to suspension or expulsion under this act. According to the law, restorative practices should be the first consideration to remediate offenses such as interpersonal conflicts, bullying, verbal and physical conflicts, theft, damage to property, class disruption, and harassment and cyberbullying. Whether the pupil is a student with a disability. The seriousness of the violation or behavior committed by the pupil. Whether the violation or behavior committed by the pupil threatened the safety of any pupil or staff member. Whether restorative practices will be used to address the violation or behavior committed by the pupil. In situations where students would typically be subject to a consequence such as expulsion/suspension, detention or other disciplinary action, students are offered an alternative way to repair the harm that has been done. Students that are willing to accept their responsibility and part in the offense, are offered the opportunity to participate in a Restorative Justice Mediation. At the mediation, students work together to find solutions and work out an agreement to help heal the harm. Students realize that refraining from poor decisions creates a favorable future where self-worth and value in our community can be re-established. The Restorative Justice process has been shown to help keep children in school, reduce risk, and create a positive community that moves towards peaceful conflict resolution and compassion for each other. Academic performance, belittling/taunting, money/theft/property damage, physical altercation, policy violation, rumor/gossip, social media/harassment/web posts, threats/harassment, truancy/school attendance and verbal altercation.